The solution to fake news is more practical than you might think. "Magic mirror in my hand, who is the fakest in the land?" The potential for sarcastic comments about the German politics magazine Der Spiegel (German for mirror) is inexhaustible. The left-wing media source has been particularly vocal about its opposition to Donald Trump from the get-go, most iconically depicting him cutting off the head of the Statue of Liberty. In another cover, Trump's head is seen rocketing towards the planet like an asteroid with the title "The end of the world." What came back was "In einer kleinen Stadt" ("In a small city"): a long-form report on the city of 13,000 inhabitants. The story described multiple people, their daily lives, and why they voted one way or the other. Relotius had clearly made up facts to give the story a spin.It’s just that a staggering amount of details were false—names changed and stories told that were embellished, fictitiously extended, or outright invented. For instance, the journalist added that the town had a sign saying "Mexicans Keep Out" in the entrance despite no such sign having ever existed. He also described a Mexican student being bullied and called “drug boy” and “fence boy,” claimed the local cinema was showing American Sniper at the time, and that the city was in decline economically and population-wise. It all fit perfectly into what a German upper-middle-class left-wing Spiegel reader would expect a town in Minnesota to look like. Overall, the German Spiegel reporter clearly went in with the intention to make the people of Fergus Falls look bigoted for the purpose of painting Trump supporters that way. And that's not hyperbolic—by Spiegel's own admission, Relotius had floated the "details" of his story prior to his return to Germany. He emailed his invented story parts to the newsroom beforehand in order to test the waters for the 10-page report he published later. Relotius wasn't just a desperate reporter returning from a long trip from America with a weak story and in fear of not being paid; he was deliberately framing his report ideologically. Relotius was a freelancer who was commissioned by a number of outlets for reporting. When Spiegel investigated his story and found the mistruths, they themselves uncovered it publicly. He was quick to admit the lies, and it seemed (to Spiegel's own reporters) as if he was saying that they caught him this time because they were daring inventions. This leaves the potential for hundreds of his stories having been falsified. 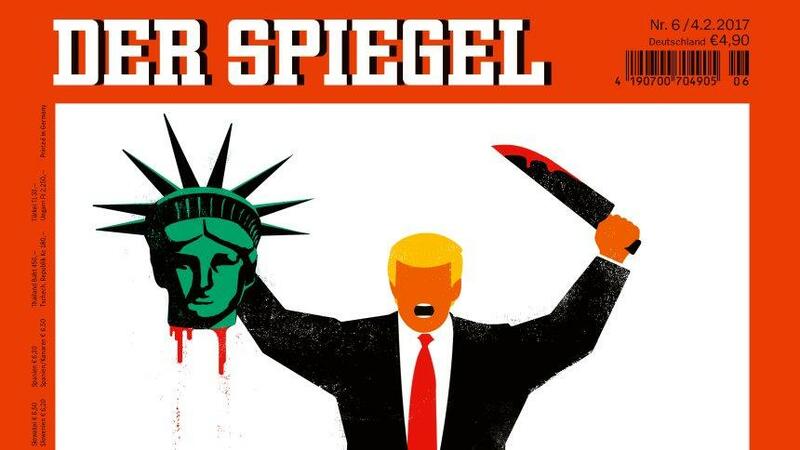 Given the fact that the Spiegel magazine is visibly anti-Trump, doesn't it raise questions about the objectivity of the report? CNN awarded Relotius with two "Journalist of the Year" awards, which it retracted after the news of the falsifications broke. The network was quick to make excuses, saying "Relotius was not associated with CNN, he never worked for the company and never had anything published on CNN platforms." No wonder the station is quick to brush it off—because otherwise, it would beg more questions. Does CNN not fact-check the stories of journalists it gives awards to, or are the reputations of the outlets that publish the journalists sufficient? Given the fact that the Spiegel magazine is visibly anti-Trump, doesn't it raise questions about the objectivity of the report? And if CNN isn't interested in those implications, is that the end of any type of difference between CNN and MSNBC? We'll see how well-received the next "Journalist of the Year award" will be. The Spiegel Claas Relotius case is more than just CNN or a left-wing magazine in Germany caught up in fake news. It's about how we read a story in the first place. Spiegel's Washington correspondent, Christoph Scheuermann, wrote one of the extensive pieces the magazine has published to retract, apologize, and reflect on the mistakes that were made. Scheuermann makes the observation that clearly the magazine cannot be expected to fact-check conversations with interviewees (even though he says this is something that is practiced in the United States) but that—more importantly—observable facts were not double-checked. Fergus Falls is also not 2,200 kilometers airway distance from New York as described in the text. The inhabitants have not always elected Democratic candidates for 40 years, as it says in the text. In 2012, for example, they voted for Mitt Romney. It's also unlikely that the head of the administration of the city said he's shooting wolves when he goes hunting because wolves are protected in Minnesota. The stuffed wild boar in the Town Hall mentioned is also unlikely, as there are no wild boar in Minnesota. The restaurant "Union Pizza & Brewing Co.," which is called "Pizza Union" in the text, is by far not "the only pub" in the village. And Fergus Falls is also not 2,200 kilometers airway distance from New York as described in the text. An artist and an IT consultant from Fergus Falls investigated the Relotius report themselves, translated it, and contacted the magazine in Hamburg, Germany, long before the latter looked into the story itself. They received no answer. Is it surprising? Someone working at a left-wing magazine in Germany receiving a message from inhabitants of what he or she already believes to be bigoted Trump country who are claiming a Spiegel story is fake news. The best-case hypothesis is that Spiegel magazine doesn't read incoming messages. The worst-case hypothesis is that it was simply not interested. Relotius had an enviable task. He was allowed to live for five weeks among people who wanted to explain to him how America ticked. He had ten pages. He didn't want to or couldn't listen to them, he didn't want to write down their stories as they were. What a damn waste. But I still don't know if I feel any better about this magazine, and I become more suspicious of media outlets presumed to be the gold standard of hard-hitting journalism. The solution isn't ideal: Read your news like it could be fake. I'm saying "your" news for a reason. It's easy to turn detective on a story from an outlet you deemed dishonest in the first place, but it takes more courage and integrity to take your favorite writer with a grain of salt. And while that is disconcerting, it's hardly news that some people lie and that some get caught. However, you only reveal yourself to have integrity if you're practicing more skepticism towards those on your side, as well. Journalism is, like any other product or service, a subject of supply and demand. If you don't demand fact-checked work, you won't get any.